Veteran left-winger Tony Benn is planning to stand for Parliament again, he has said. The 82-year-old, a Labour MP until 2001, wants to be the party's candidate for Kensington in west London. Mr Benn said: "There's a general election on the way and Kensington is looking for a candidate. I've written to them to see if I can stand." Mr Benn's son Hilary is in the Cabinet and his granddaughter Emily is already a Labour candidate in East Worthing. Mr Benn, who was an MP for almost 50 years before retiring, said: "If they would like me to stand, I would like to be there. "I'm not sure if I would be selected but I'd like to do it. I don't think my age would be a problem. "I believe in saying the same thing inside and outside Parliament. "I believe in peace, not taxing students with enormous loans and securing a referendum on the EU." 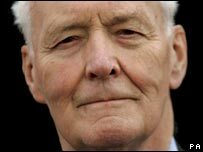 Mr Benn is an outspoken critic of the war in Iraq. The Kensington constituency, submerged into Kensington and Chelsea in 1997 boundary changes, has been revived in the latest seats shake-up. This will come into effect at the next general election. Currently represented by Tory former Foreign Secretary Sir Malcolm Rifkind, it is one of the safest Conservative seats. But the party's margin is expected to be much smaller in the revived Kensington, which retains poor areas of Notting Hill in the north but loses some of the rich south. Mr Benn's son Hilary is currently the environment secretary, while 18-year-old granddaughter Emily is the Labour candidate for East Worthing and Shoreham for the next general election.